Digital Mortgage Webinar Recap: What Exactly is an eNote? Recently, eOriginal hosted the first webinar in our digital mortgage series. The goal was to offer a dynamic conversation with industry experts weighing-in on the digital mortgage revolution. Specifically, we wanted to highlight the eNote, its legal enforceability, and the state of industry adoption. For the live online event, I was joined by Brendon Weiss, Chief Operating Officer at MERSCORP Holdings, Inc., Margo Tank, Partner at DLA Piper, and Shane Hartzler, Fannie Mae’s Director of eMortgage Strategy and Operations. What is an eNote and why is it important? As discussed during the webinar, an eNote is an electronic version of what has traditionally been a paper document. Since it is electronic, it needs to be created, signed, and managed in a specific way to ensure that it has the same legal enforceability as paper. This is the most critical document for all parties in the mortgage ecosystem, including lenders, originators, warehouse lenders, custodians, investors, and servicers, as its validity is essential for the downstream life of the loan on the secondary market. Previously, there has been confusion surrounding the eNote. However, it’s no different than any other document requiring signature at the closing. And thanks to ESIGN and UETA, the eNote can be signed in every state. I can think of several instances when I’ve spoken to someone and they’ve mentioned, “I don’t think that my state accepts eNotes.” That common misconception is caused by confusion with eNotary, which is very, very different form the acceptance of the eNote (which I will explain in a later post). The eNote can easily be incorporated into the closing process as it’s just another document. However, it can also be the foundation of the full eClosing strategy. From the perspective of a lender, the benefits of eClosing include a better borrower experience, expedited sale to the secondary market and faster replenishment of capital. It is the authorized registry that identifies the current Controller (holder) and Location (custodian) of the Authoritative Copy of an eNote. The Controller of an eNote can have the equivalent rights as that of a “Holder in Due Course” of a paper negotiable promissory note. The MERS® eRegistry is the mortgage industry’s “system of record” for holders of eNotes. A national eNote registry is part of the industry’s response to develop systems that can rely upon the Uniform Electronic Transactions Act (UETA) and the federal Electronic Signatures in Global and National Commerce Act (E-SIGN) to establish legal effectiveness of electronic notes for mortgage loans. As my colleague Bill Mitchell stated previously, the benefits of shifting from paper are immense, with technology focusing on speed, accuracy, data quality, and of course the transparency that is pivotal to winning the business and driving down costs for origination channels. This next phase of the technology revolution in mortgage is largely focused on the demand for transparent creation, execution, tracking and delivery of the asset. 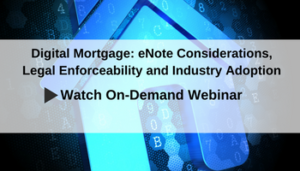 In closing, I invite you to watch the on-demand webinar for more detail on the eNote and why it is critical to digital mortgage. Additionally, if you are attending IMN’s 5th Annual Mortgage Residential Servicing Conference next week, please be sure to attend our panel, Phase I Meets Phase II: Improving Data Quality in the Digital Mortgage Era, at 8:25 a.m. on March 27. This entry was posted in Digital Mortgage, eMortgage and tagged eNote.